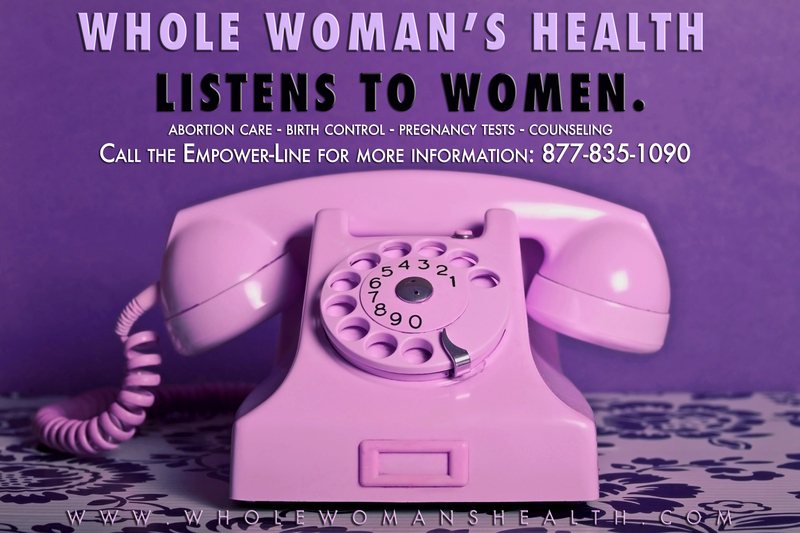 Whole Woman’s Health is proud to finally introduce our new state-wide Empower-Line! Texas ladies (and gents) can now call us 6 days a week, ~12 hours a day to ask questions or make an appointment for any clinic in the state. Our phone counselors have been trained extensively on everything from answering your specific questions about abortion care, to helping us all understand the new Sonogram Law a bit better. There’s no such thing as a bad question, here. Current phone operating hours are Monday – Friday, 7:30AM – 7pm, and Saturday, 7:30 – 2:30pm. If you call at any other point, leave us a voicemail and we’ll be sure to get back to you within 24 hours. You can also make an appointment on our website, or send us an email at info@wholewomanshealth.com. * Our clinic in Baltimore, Maryland has an Empower-Line too, but at a different number of course. Call 1-800-997-7942 to reach us there!